Born in Matamoros, Mexico, Cristian Damir Martinez Vega started his formal musical studies at age fifteen in Colegio San Juan Siglo XXI, where he was a student of Marga Lopez, Mauricio Fortuna, Joaquin Ruiz, and Ruby Hernandez. He continued his studies at The University of Texas Rio Grande Valley, where he received a generous scholarship and served as concertmaster of the university orchestra. While still a student, Martinez Vega also held a violin position in the Valley Symphony Orchestra in Edinburg, Texas. Summer festival performances include the Laredo Music Festival, Festival de Música Santiago de Querétaro, Music in the Mountains festival in Colorado, and the Rheintalische Musikschule Symphony Orchestra in the city of Lusteanu, Austria. 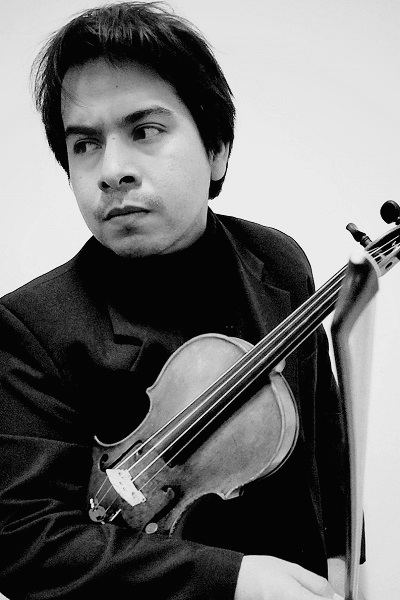 In 2017, Martinez Vega was admitted into the graduate program for chamber music at Wichita State University, where he was a student of violinist Betūl Soykan and took additional viola lessons with Prof. Catherine Consiglio. Additionally, he performed as a member of the Bloomfield string quartet coached by the cellist of the Grammy-nominated St. Petersburg String Quartet, Dr. Leonid Shukaev. Throughout his career, Mr. Martinez Vega has been exposed to a variety of different musical backgrounds. He was a member of the Mariachi Reynas & Reyes in Mexico, he also performed rock and pop showcases as part of Viol Consort String Ensemble, and earlier this year he was featured in the Wichita State Musical Theater’s production Little Women. Cristian Martinez Vega also co-organized a cultural project in his hometown entitled “Sociedad de Música de Matamoros” where he performed with a collective of musicians in different venues ranging from concert halls to general public settings. Mr. Martinez Vega has participated in masterclasses with violinists Martin Valdeschak, Rudolp Rampf, Markus Ellensohn, Adrian Justus, Erika Dobosiewicz, Laura Hilgeman-Miller, Jesse Mills, Lian-Ping How, Elmar Oliveira, Jinjoo Cho, and Jaime Laredo. Twenty-three-year-old violinist Cristian Martinez Vega currently performs in the Wichita Symphony Orchestra and has performed in the Wichita Grand Opera. This summer, he will be performing in the Newburgh Chamber Music festival in New York, The Mediterranean Opera Studio’s Festival Orchestra in Italy, and the British Isles Music Festival in England.